So today I made a second card very similar, but added some special effects. This time, I made it look like a piece of art hanging on a wall ... at least that's what I was going for :) I made a trip to an art store yesterday and picked up some new-to-me supplies, one that I used on this card. It is a gel medium that is filled with tiny glass beads. I used my palette knife to scrap it over top of the watercolored background (a leftover piece from my card from last week). I LOVE how it looks. It adds texture, sparkle and shine to the image. 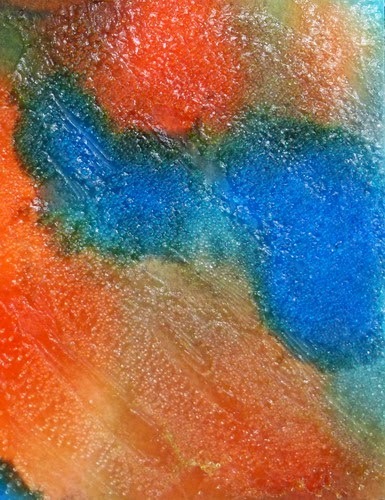 It dries clear, so the colors show through - I just love it and look forward to experimenting more with this product. I'm including a couple of close-ups so hopefully you can see the texture and shine from this glass bead coating. Today I'm also sharing two more cards from my Dirty Dozen Design Team for last October - theme "It's about Time". The sentiment is computer generated, so I printed that onto my card front first. Then I splattered the background with a toothbrush loaded with diluted re-inker. I didn't have a clock image or die, so I printed off this clock face from the internet, adding a bit of brown sponging around the edges to give it even more of an aged look, and then mounted it on a circle of heated copper. I mounted the "clock" onto a banner cut from burlap ribbon. The second card is celebrating "vacation time" ... now I would like to be in a place like this! :) I brayered the sky and stamped a silhouette of palm trees. I then mounted it behind a square cut-out so that it's like you are looking through a window at a beautiful sunset. So awesome - I love it against the black too! I love your art work and think Jer will love it too and be very proud of you! He's obviously a very good teacher! The shimmer is amazing! I think this is the most amazing clock I've seen on a card! And the 3rd card sure looks like Paradise! Love all three cards. So impressed with the clock you made. I kept looking at it and thinking 'did she find someone thats mankes miniture clocks'. The copper ring is perfect. You are so clever, I totally enjoy visiting your blog. 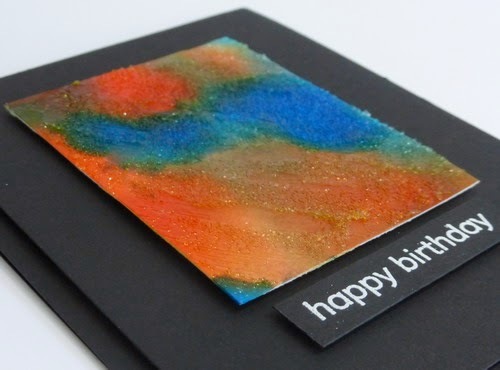 Your use of unique materials make all of your cards memorable and your son will love his birthday card. Mag-NIF-icent! I am so loving #1...that coloring is brilliant, and I've seen those beads, didn't know what they were. They rendered such a glaze & sparkle to this splash of color. And it reminds me of a fiery sunset, even more than #2 did. Also very beautiful. Imagine my smile, when I read it was a SScape, and I have that stamp (even more amazing is: I know where it is stored!) You really used this SS to great effect in making it a window view. Both cards are stunning. Always get so much inspiration here. I know where your artist got his talent too! TFS & Hugs. Hope things are going ok at your house, and Happy Birthday to your son as well. 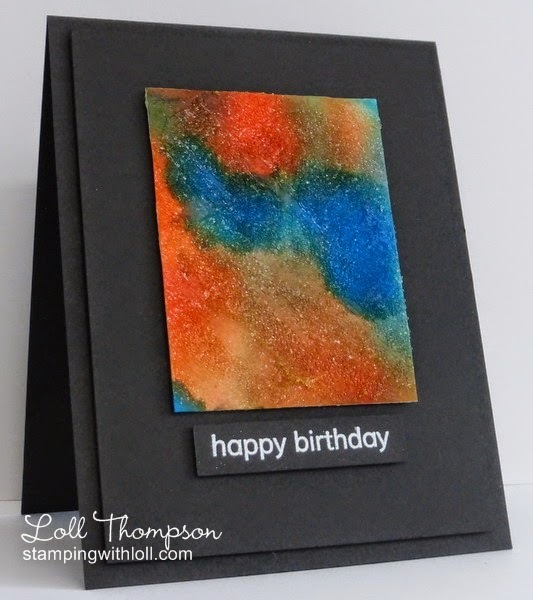 Amazing colours in your first card Loll and the beaded glaze adds great texture. I got up real close to your clock card it looks so real! That wonderful sunset is calling me too although we have had a stunning day here today. Loll, it does look like art hanging on a wall. You accomplished what you set out to do. I love the glass bead coating and your colors are fabulous. Your Dirty Dozen cards are wonderful. 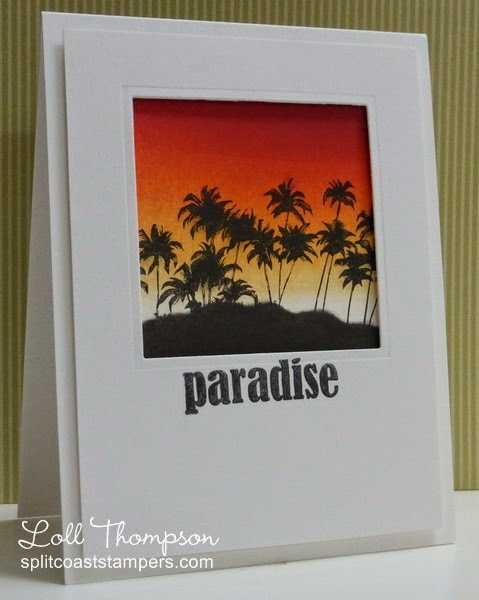 You really made me want to go on a vacation (where there are palm trees) just looking at your Paradise card. Wow! Three fabulous cards! Jer will love his birthday card as it is very artsy. Fabulous colours and I love your new gel medium! Love the splattered background and the use of burlap on the clock one. And the sunset one is so beautifully brayered! I am thinking your son is not the only artist in the family!!! Beautiful art that you call cards! Absolutely stunning artwork befitting your artist son! I say like son...like mother....you are indeed an artist too, Loll! Love the colors and the glass bead medium...such a rich, textural look...absolutely fabulous! He's going to love it! These are all fantastic cards! I really love how you used that gel medium on the first one. That is so neat! Thanks so much for playing along with us over at the Simon Says Stamp Wednesday Challenge! WOW! It's always a pleasure to visit your blog, Loll! Your cards are a work of art...every one of them! I love the shimmer on your first one, and I think it should be framed! Looks a bit like a sunset to me...so pretty! I also love the cards you shared with us from your 'Dirty Dozen Design Team', too! 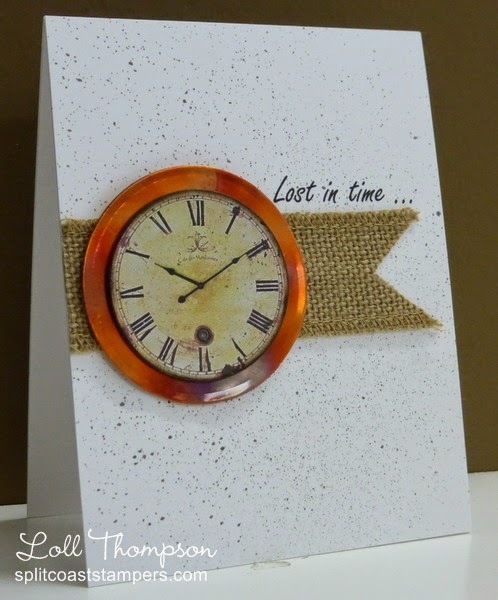 Such awesome texture and dimension on your Lost in Time card...love the burlap tag and woodgrain on the clock, and your inking/blending on your Paradise card is exquisite...just like a place I would like to visit right about now! Thanks so much for sharing all of this lovely 'eye candy' with us today...I'm inspired, for sure! Beautiful cards, Loll...ALL of them! Your art inspired card is so stunning! I can see why your son loved it! I just love how all that dreamy color is showcased on grey!!! Loll, I love the electric, shimmery colors of your card! So glad you joined us at CASology!